Savvy growers know to diversify their approaches to watering and fertilizing outdoor cannabis crops. With this approach, gardeners achieve far more versatility in troubleshooting and dealing with scheduling constraints. For some cannabis growers, this notion means combining techniques of both hydro drip-systems and hand-watering. More specifically, this concept involves using a “straight-water drip-system” in conjunction with the hand-watering of nutrients. In this case, a little cultivation technology goes a long way. Hand-watering nutrients forces hydroponics irrigation farmers to be more hands-on with their crops when fertilizing. This intimate exchange with plants promotes a critical examination of the entire garden. This practice is often lacking in automated horticulture situations. Also, a hydro drip-system provides horticulturalists a bit of a “security blanket” with watering. Because, the drip can sometimes “cover” the recurring chore of hand-watering when a conflict arises in one’s schedule. Finally, the hydro drip-system and hoses can sometimes be used functionally in an interchangeable fashion. 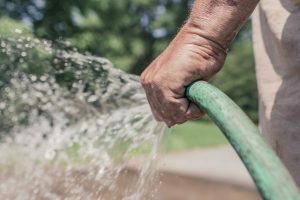 To elaborate, the hose can be used in hand-watering to periodically flush out salt deposits in the soil during a long summer growing season. Similarly, the hydro drip-system can be used to fertilize the garden in the event of a scheduling emergency. With this practice, nutrients can be mixed and aerated in advance of the actual feeding time. By setting up one’s cannabis garden with both hand-watering and hydroponics systems early in the season, one can help ensure a bountiful crop by diversifying watering techniques with anticipatory planning. In deciding whether or not to invest time and money in both hand watering and hydro drip-irrigation systems, gardeners should first consider their geographical locale and subsequent cannabis cultivation environment. In hot, dry climates as seen in inland California, daily watering is essential in the health of sun-loving crops. However, for many outdoor growers in these areas, hand-watering can be quite a chore. Largely because, the prospect of hand-watering plants every morning for an entire spring, summer, and fall is rather daunting. As a result, placing a consistent straight hydro water drip right on the root-ball of plants can really help eliminate the stresses of a daily morning watering routine. With this practice, a majority of hand-watering only occurs with fertilization. More temperate and humid areas of the United States present different challenges with this system. In places such as the Midwest and the East Coast, the consistency of a straight-water drip will probably need to be regulated with a timer. Because, the climactic demands for a hydro water system aren’t as explicit in these geographies. As can be seen, the benefits of diversifying you watering approaches are applicable in all geographic locales. However, they must be refined according to the environmental considerations of outdoor cultivation operations. The size and type of a grow container, as well as the choice of a growing medium, are the next most important factors in choosing to implement both hand-watering and hydro drip-irrigation strategies. Lets first look to gardeners choose to use a coco-mix, or a similar light growing medium that easily dries out. In these situations, a hydro straight-water drip can be a great way to ensure consistent moisture in a root ball. In a like fashion, a hydro drip will be beneficial for those who like to use well-aerated fabric pots which lose water easily. This simple hydro system can be just what’s needed to give plants an extra push in the summer heat. This combination is a great option for outdoors cannabis cultivators whom use 100 gallon (or plus) sized pots. Because, strictly using drip-irrigation set-ups for such large pots is both difficult and inefficient. To this end, there is a large square footage of soil surface to cover in these pots. By utilizing a combination of drip-irrigation and hand-watering, one ensures a more even distribution of nutrients above the entire soil surface of large pots. Yet, the system still utilizes some of the convenience of automation. 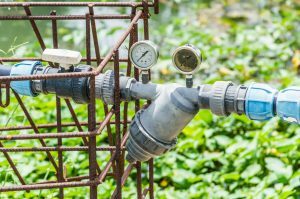 The water source present at the garden site as well as the sorts of nutrients and teas being used for fertilization are also important factors in considering the implementation of a hand-watering and drip-irrigation combo. Water quality is determined largely by its source. These sources generally being from either “city-water” or a well. For those lucky well-water gardeners, a straight-water hydro drip-system can often be run directly off of a standard home water connection (depending on water PH as well as the water table quality). However, if a garden is irrigated purely with city water, this treated water usually needs to be filtered or has to sit in a holding pond to eliminate chlorine additives. After that,it is then pumped out of the reservoir by an electric pump. Nutrients and teas are the final factor to weigh when deciding to diversify one’s watering approach with both systems. By hand-watering when fertilizing, a thorough spreading-out of this mixture on the soil surface will help ensure an even disbursement of salts within a growing medium. By manually feeding plants an even amount of fertilizers, farmers avoid the notorious “hot spots” in soils . These spots are caused by the concentrated nutrient drip of a pure automated irrigation system. Finally, using a drip-system strictly (except for emergencies) for straight-water will keep the system from clogging. This is an issue which plagues hydro cannabis farmers whom use thick organic nutrients and teas.